Stay in touch around the office - Jabra PRO™ 9400 is the first series of wireless office headsets with user-friendly touch screen for easy call control. One headset for all your phones - Todays business cards often feature different numbers for desk, mobile and softphone. The result? You find yourself grabbing your mobile just as the caller gives up and tries the desk phone instead! Designed with busy office professionals in mind, Jabra PRO™ 9400 series can save you a lot of hassle. Thanks to Multiuse technology, all your phone calls come to the same headset. Just tap the talk button and start talking. User-friendly touch screen - Up to the three devices desk, mobile and softphone are united by a stylish touch screen base. 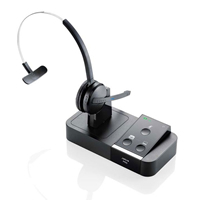 The base connects to your headset via DECT a technology characterized by its reliable, long range capabilities offering a wireless range of up to 150m. Equipped with a SmartSetup wizard, the touch screen helps you connect phones and choose preferences to get started. Once youre up and running, its colorful icons and intuitive menu system make call-handling a breeze. Unbeatable sound - Several state-of-the-art sound technologies enable Jabra PRO 9400 Series headsets to deliver unrivalled call clarity and safety. State-of-the-art noise-canceling technology and advanced Digital Signal Processing practically eliminates all background noise, so your voice can always be heard clearly. Wideband sound ensures that the sound you hear is crystal clear, while SafeTone technology protects your hearing by cutting off sudden loud noises and securing safe average sound levels through the day. Device Type Monaural ear - Lightweight office headset. Designed for all day use.